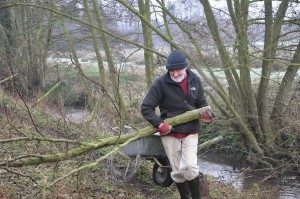 With the brilliant Dominic Arnold on digger, Nigel Holmes (river restoration expert) as supervisor and a hearty dozen RGCG volunteers, we were able to combine woody debris installation work with stream bed modification at numerous points (>50) over 2 days. The Gunthorpe stream is known to support lower than expected numbers of fish; one reason may be a lack of habitat diversity. 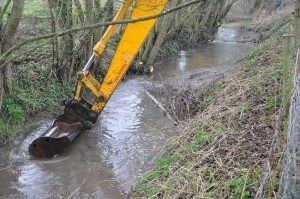 In particular the stream is generally fairly uniform in terms of water depth and tends to lack pools (deeper areas), riffles (fast water with oxygenated gravel) and woody debris (fallen trees). These habitats variously provide hiding places, feeding habitat and spawning for fish, which include eel, bullhead and brown trout. 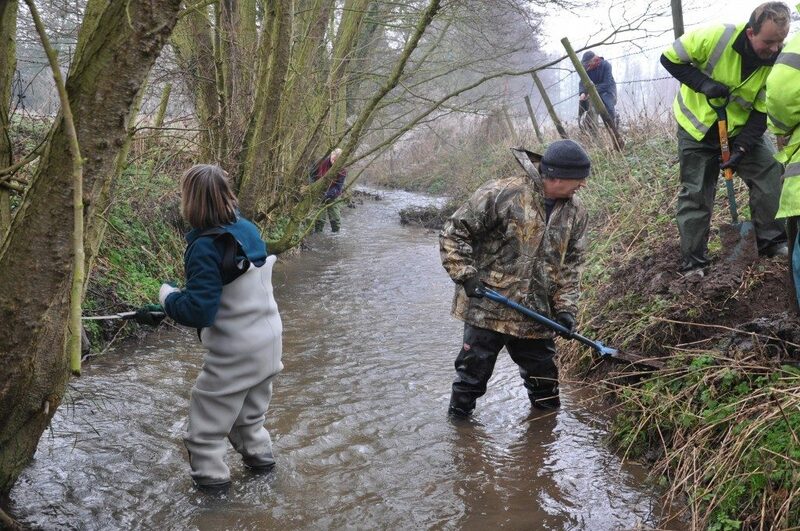 We are grateful to the Norfolk Rivers Trust and the Environment Agency who arranged electrofishing surveys prior to the work (December 2013). We look forward to future fish surveys to hopefully prove that the restoration work has been locally beneficial. We hope that the trout and eels were smiling when we left! Thanks so much to everyone that helped out. If anyone is interested in getting involved with future RGCG volunteer days please do get in touch with me.